Andrew Jackson Longstreet, miner, rancher and reluctant gunfighter entered life some time in the 1830s possibly in Louisiana. He claimed to be a distant relative of Confederate General James Longstreet but there’s no evidence to support that claim. Some writers claim that Jack Longstreet fought in the Civil War – again there is no evidence of his having served on either side. He tells that early in his career a posse of ranchers caught a gang of cattle rustlers with whom he was riding. Longstreet was spared the fate of his partners because of his tender age of fourteen. However, as punishment, they cut off one of his ears. His well-established reputation with a .44 preceded his arrival in southern Nevada in 1882. According to some who knew him, Jack was tall with wide shoulders -- a man who kept to himself like a few others that arrived a few steps ahead of the law. Jack came from the South and worked on the Colorado River while trying his hand at prospecting in the Arizona Territory. From there he migrated to Muddy Valley - - an area settled by Mormons a few years earlier. A newspaper reported that a man named Longstreet opened a saloon and drug store in the town of St. Tomas. That’s interesting. In those days he would have sold patent medicines such as Caffy’s Elixir or Vapor-Oil Treatment No. 6 both containing alcohol and opium sufficient to render his customers easy prey at the poker table. His next enterprise took shape on a 160 acre ranch near the Moapa Indian Reservation where he raised horses and a few cattle that came with questionable title. Here he befriended the local tribes, learned their language and strongly supported their grievance against the Bureau of Indian Affairs for all manner of mismanagement by the superintendant. Jack had some education as shown by letters that he wrote to the Bureau of Indian Affairs in Washington listing specific charges against the superintendant -- letters that led to the superintendant’s dismissal. The local ranchers held weekly horse races where sizable bets were made. Jack had a pony that won more races than it lost. His neighbor Alexander Dry sported a pony that on one occasion won a good sum of money from Jack. That loss along with a number of other issues led to a state of hostility between the two. By spring, the two men seemed on better terms and were seen riding out of town together one afternoon. That evening Longstreet returned alone and turned himself in to the deputy sheriff claiming that he had shot Dry in self-defense. He stated that Dry had drawn on him and he was forced to kill him. Dry had done some killing on his own the year before so his death drew no sympathy from the locals. The justice-of-the-peace accepted Longstreet’s account and being that there had been no witnesses to the shooting ruled self-defense. A restless nature along with unpaid back taxes served as good reason to move on to new adventures. The Oasis Valley, located 90 miles northwest of the Moapa Reservation, had a good stream with grassland on both sides -- ideal for raising horses. Records show that Longstreet filed a homestead on 160 acres at the north end of the valley. His intension was to do some prospecting in the surrounding country while leaving his ranch in the care of a neighbor. The Sylvania Mining Camp got started on its second tent revival when Jack arrived to open a saloon. Jack displayed his unusual nature by shooting holes in the top of the saloon tent as a warning to his patrons that gun play was not allowed. In the early 1890s, unrest among the southern Indian tribes became apparent as large groups engaged in strange ghost dances portending the arrival of a messiah bringing fire and deadly snow storms. White settlers became alarmed fearing a native uprising. One evening, a group of natives led by Longstreet surrounded the home of the superintendent of the Sylvania Mine. After being rousted from his bed, the man took flight around his yard while the natives swatted his naked backside with sticks. The beating was not without merit. The Indians who worked at the mine were owed a sizable sum in back wages. The incident caused the superintendent more embarrassment than pain and led to the workers receiving their due. The superintendent filed a complaint against Longstreet along with a number of the Indians involved. This led to a warrant for their arrest issued by the sheriff of Inyo County. The sheriff stated that because of Longstreet’s unpredictable and dangerous nature he would be unable to raise a posse willing to go after him. One of the deputies sent word to Jack that he should leave the area until things blow over. He took the deputy’s advice and headed for the Mexican Border remaining there for the next four years. Ash Meadows, a boggy screed of desert located near Death Valley, attracted a number of early settlers looking for a place to raise cattle. The water ran on or near the surface creating small pools and some stands of grass. On his return to Nevada, Longstreet acquired an existing ranch and built a cabin near one of the pools. Now in his 50s, still carrying himself like a much younger man, he remained without question the best shooter south of Salt Lake City. The well known Montgomery Brothers opened two mines at a nearby camp called Johnnie. They left the mines unattended while they went in search of needed capital for their development. Unfortunately, the required assessment work on the mines had not been completed. This allowed their claims on the properties to laps. Angus McArthur a nearby rancher found out about the lapsed assessments and filed a claim on one of the mines named the Chispa. The Montgomery brothers eventually found financial backing and returned to start operation at the Chispa totally ignoring McArthur’s legal claim. McArthur decided that rather than fight the brothers in court he would take possession of the mine by force. He got four men to join his cause for a piece of the mine -- Paul Foot, Billy Moyer, George Morris and Jack Longstreet -- men reported as “desperate professional fighters”. McArthur’s men captured the Chispa Mine without firing a shot. They brought in provisions and prepared for a battle that surely would come. According to newspaper accounts, the Montgomery backers raised an army determined to retake the mine. Some claimed that at least 20 armed men had set up their camp below the mine entrance. The action started early one morning, when a shot rang out toppling Paul Foot as he sat eating his breakfast. It soon became apparent that the Montgomery brothers had overwhelming numbers and surrender was the best way out. Longstreet signaled the end of the standoff when he came out of the mine waving his wife’s white petticoat. Montgomery agreed to let them ride out and get help for Paul Foot who died later that day of his wound. 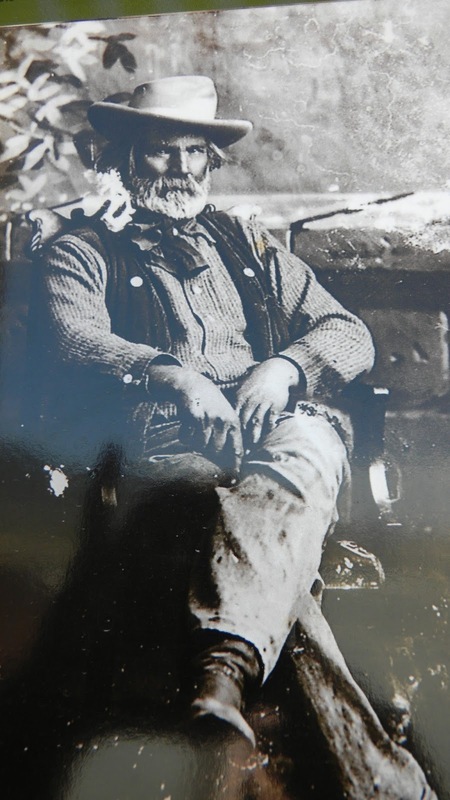 The shooter was never identified but was believed to be Harry Ramsey a miner and gunfighter who reportedly had seven notches carved on the handle of his gun. The Belmont newspapers reported that two men had been shot and that Longstreet had been killed at the Montgomery District. The story was corrected a few days later when Jack Longstreet rode into town. The county had difficulty deciding whom to prosecute. McArthur was not charged for taking the mine by force because that would open questions about his legal claim to the mine which Montgomery didn’t want brought up. Finally, the county prosecutor charged Longstreet, Morris and Moyer with the ridiculous charge of drawing and exhibiting deadly weapons. In those days that could hardly be considered a crime. The three were found guilty, given a hefty fine and released after posting bail. Jack swore that he would never again use a local attorney to plead his defense. Jack needed to find a secluded place were he would be left alone. The Kawich Mountains located southeast of Tonopah drew his attention and the Red Rock Ranch nestled in a protected canyon would meet his need. The Edward Clifford family ranched at a place in Stone Canyon. For some reason they had it in for Longstreet almost as soon as he arrived and accused him of butchering one of their cattle. An argument between Jack and one of Clifford’s sons broke out in an office in Tonopah. When Longstreet pulled his gun a witness hit his arm and the shot went wide. A rancher friend of Longstreet had been murdered and the Clifford family had been suspected of some involvement in the crime. Jack believed that Clifford wanted to silence him from publicly accusing them of foul play. The next encounter is best described by the court record of the trial charging Longstreet with assault with intent to kill: According to Clifford and his witnesses: “He accompanied by his son-in-law J.B. Nay were riding toward their home at Stone Cabin when at a point near Low Pass they met Longstreet and Jim Smith. They were dismounted within about 150 yards and Longstreet was carrying a gun. They at once dismounted and almost immediately two shots came from Longstreet one taking effect in Nay’s left leg”. Jack testified that: “The Clifford family wanted to silence him because he kept talking about the murder of his friend. That he was out gathering cattle near the Red Rock Ranch when the Clifford party suddenly appeared over the little rise about 300 yards away galloping rapidly toward him. At a distance they dismounted and shot twice at him, one bullet tearing up the dirt at his feet. He fired back at the only man of the party who had not taken cover”. Longstreet’s attorney Key Pittman’s brilliant cross-examination demolished the Clifford witnesses one by one. The Jury took only two hours to render their verdict: not guilty. 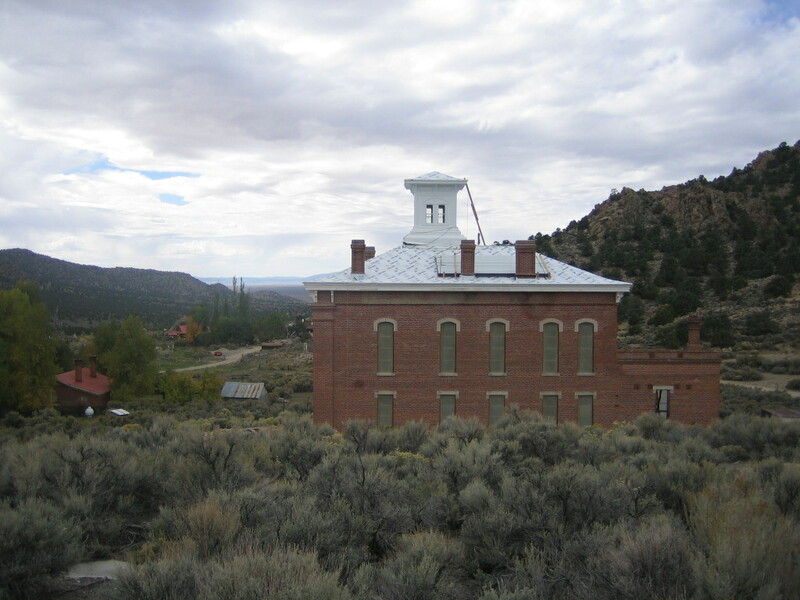 A place called Windy Canyon became Longstreet’s next asylum. 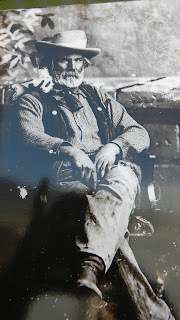 Now in his 60s, with some wealth accumulated from the sale of his ranches and mining interests, he would spend his remaining years doing some mining at a place called Longstreet. He would add one more notch to his Colt long barrel .44 by putting three holes in his brother-in-law Bob Black. A man wanted by the authorities for a number of murders committed upon his tribesmen at Ash Meadows. After the Bob Black incident, Longstreet seemed to stay out of trouble. No more shootings or other actions that might have captured the attention of those who closely followed his career. He survived into his 90s still active, still winning horse races. The end came as a result of a self-inflicted gun shot wound to his upper arm and shoulder that led to complications. He died in 1928 and is buried at the Belmont Cemetery.